Group One winner Peggy Jean will be a star attraction at June’s Magic Millions National Broodmare Sale at the Gold Coast. A multiple black type winner as a juvenile, Peggy Jean shot to prominence when she scored a comprehensive win in the Group One ATC Sires’ Produce Stakes at Randwick. Another successful graduate for the Ward brothers’ Triple Crown Syndications company, Peggy Jean will be presented at the Gold Coast by Yarraman Park following her first service last spring, a September cover to outstanding Hunter Valley sire I Am Invincible. “The outstanding stakes winner to runner ratio of Chris and Michael’s Triple Crown operation is highlighted by Peggy Jean and Magic Millions is honoured to have been chosen to market this high profile mare,” Magic Millions Managing Director Vin Cox said. The Myboycharlie mare is from a half-sister to group performer Prince of Dane and hails from the family of Group One winners Lady Jakeo and Mrs Onassis, Merlene and also Golden Slipper fancy Capitalist. “Peggy Jean was a very special horse for all involved with her at Triple Crown and, of course, her ownership group. She was an exceptional early running 2YO who won the Group 1 ATC Sires’ Produce Stakes in dominant style on the inaugural day of The Championships at Royal Randwick. Peggy Jean ended up winning in excess of $900,000 in prizemoney for her connections. She is now proving to be just as outstanding off the track, testing in foal to one of the most sought after stallions in the country in I Am Invincible after her first cover. She has produced the ride of a lifetime for our owners and we can’t wait to see her progeny follow suit in the years to come. Magic Millions is a great fit for Peggy Jean. They consistently put on a first class sale which always attracts a strong domestic and international buying bench. 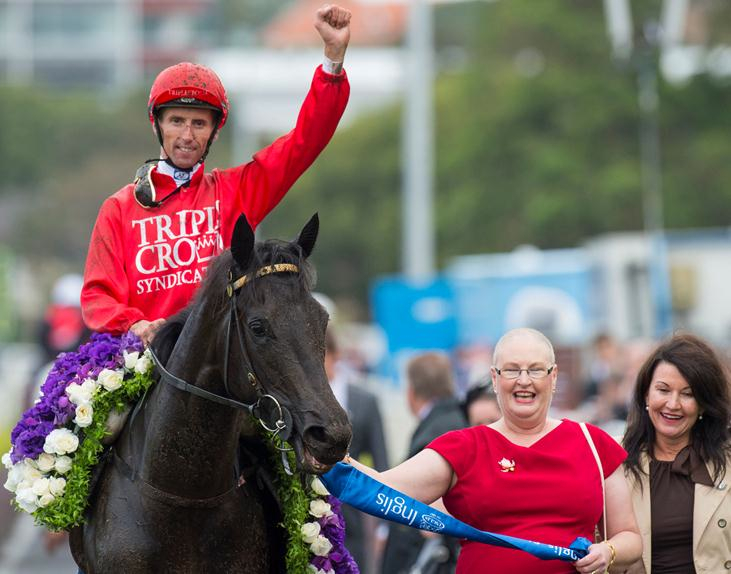 We are very pleased to entrust her sale to the Magic Millions team.” Triple Crown’s Chris Ward said.